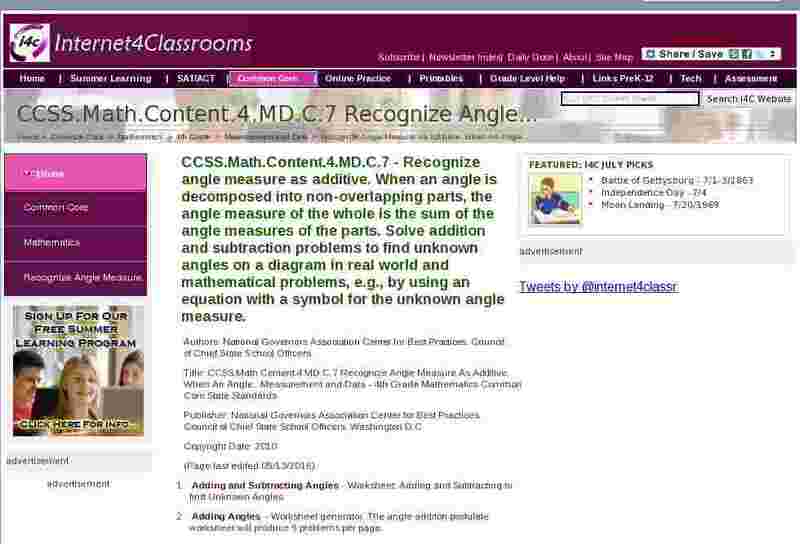 CCSS.Math.Content.4.MD.C.7 - Recognize angle measure as additive. When an angle is decomposed into non-overlapping parts, the angle measure of the whole is the sum of the angle measures of the parts. Solve addition and subtraction problems to find unknown angles on a diagram in real world and mathematical problems, e.g., by using an equation with a symbol for the unknown angle measure. Adding Angles - Worksheet generator; The angle additon postulate worksheet will produce 9 problems per page. Angle Measurement - Online quiz, adding adjacent angles. Given the size of a portion of the angle, what is the size of the other portion? Angles Around a Point - Online lesson with practice questions included. Measuring Angles Introduction - Worksheet; Solve these problems using given information.